2 Looking to buy a Bell helmet? 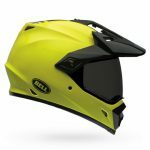 11 Best place to buy a Bell crash helmet? 16 Definitely want a Bell? 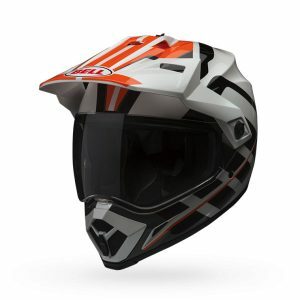 The Bell MX-9 comes in two versions – either the standard motocross helmet or the dual sports/adventure helmet, which is essentially the same as the motocross version but with a visor. Because the two models are basically the same, we’ll cover both helmets in this review. The MX-9 is a polycarbonate crash helmet with a removable sun peak, lots of ventilation and double-d ring fastener. In this review, we’ll cover all the features you’ll find on the MX-9 together with what owners think of their helmets, warts and all. 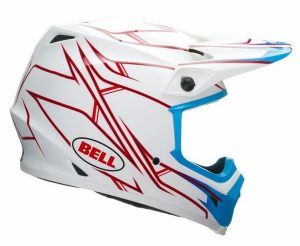 It’s important to remember that the Bell MX-9 is a lower-priced motocross or adventure helmet. So you’re not gonna get all the bells, whistles and sophistication of some of its higher-end and higher-priced counterparts. But despite this, it’s still a very capable helmet; one that its owners seem to rate highly and say that performs well in all the important areas. Sure, we can’t tell how safe it’ll be in a collision – we’ll have to wait for SHARP (or Snell) to test it and let us know. 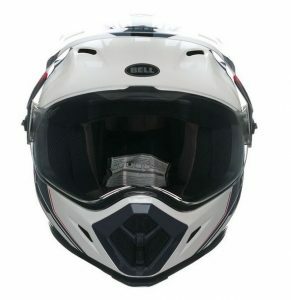 But with Bell’s excellent reputation for safety, coupled with the type of features off roaders and adventure riders are looking for – like space for goggles, good ventilation, integrated roost guard – all backed up with a 5 year warranty, you sure are getting a lot of bang for your buck. And at this price, it’s really hard to fault the Bell MX-9. We recommend SportsBikeShop (UK). They offer amazing service and really quick delivery, so please click the link to see their full range and latest prices or see here for more info on SportsBikeShop (incl delivery details, returns and our experience of ordering a helmet with them). The Bell MX-9 is both ECE and DOT certified which means it should give a decent level of protection. However, it hasn’t been either SHARP or Snell tested yet so we can’t really tell just how safe it is. Bell MX-9 Adventure in Raid orange graphics. Note Adventure comes with clear visor only. If we look back at how well Bell helmets perform when they’ve been SHARP tested though, they have historically scored incredibly well and are joint first place in our list of the safest crash helmet brands. 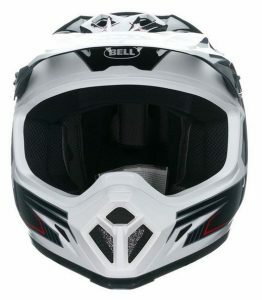 But having said that, their crown has slipped a little lately, and their latest (only) tested polycarbonate helmet – the Bell Qualifier DLX – scored three stars when SHARP tested. That’s still a decent score but possibly points to the MX-9 scoring something similar? 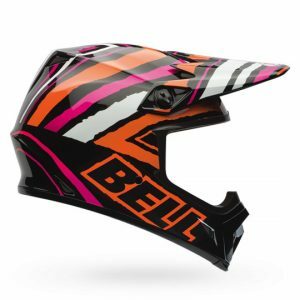 Even though it’s a cheaper helmet, the Bell MX-9 is manufactured in three shell sizes, which is a really good thing and should improve safety and fitment levels – and also make the helmet look better when you’re wearing it. Many lower priced helmets only come in one shell size so well done Bell for that. The strap is secured by a good ole double-d ring fastener which are about as safe as they come and especially good – if you’re the diligent type – because they make you adjust the tightness every time you put the helmet on. Helmet noise is a tricky one to judge at the best of times because it’s so personal (what’s quiet for one person is noisy for another). And true to form, there’s a wide range of opinions from owners to whether the MX-9 is loud or quiet. 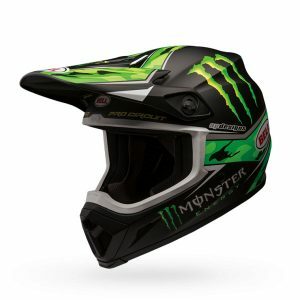 What does come through though is that it’s generally noisier than a road helmet but seems to be about average for your typical motocross or adventure bike helmet; with some folks saying it’s pretty noisy and others, fairly quiet. I think the bottom line is it depends how you ride, but don’t expect something that’s whisper quiet as you’ll be sorely disappointed. 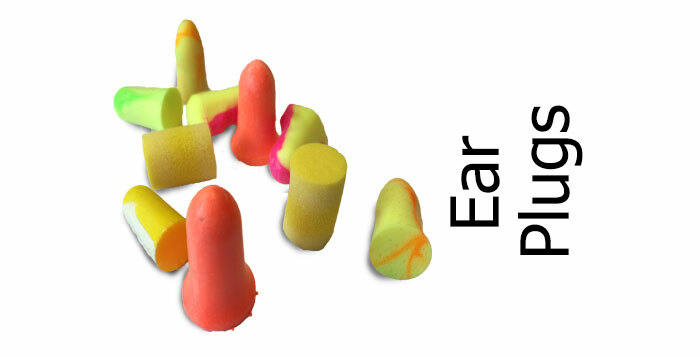 And if you do ride lots of road miles, wear earplugs. Ventilation seems to be a strong point of the Bell MX-9. It’s got loads of vents – from the three chin vents (only the central one is closeable) and two forehead vents (both always open) to the four exhaust vents – again all open all the time. The chin vents let in a load of air and most people seem to think the head vents work well too, pulling in air which is then circulated through channels in the polystyrene lining and through to your head. That includes some folks who ride in very hot weather and one guy who regularly rides in 30+ degrees C and humidity who reckoned the ventilation does a fine job. There’s always the occasional dissenter who reckons it can get a bit hot, but the overwhelming opinion online is that ventilation’s very good all round. The MX-9 Adventure comes with a fully-functioning, removable, clear visor. It operates on a four-position ratchet and has a ridge at the bottom to allow for easy opening as well as helping make a good seal against the visor gasket. MX-9 owners reckon the visor’s good – with just one niggle. First, the good. There’s a few reports that the quality of the visor is good, with very little distortion. The ratchet works well too with the first ‘cracked’ position ideal for letting in a bit more ventilation and is good for staying open in that position to around 70 mph. It’s not a quick-removal visor in the usual sense, but it’s not too tricky – just remove a couple of thumb screws, one on either side, and the visor comes off. The niggle is that the moulded-in ridge in the bottom of the visor is quite large so can get in the line of sight a bit when the visor’s in more than the cracked-open position. A couple of owners had a little moan about that. On the flip side though, one owner said he liked the way the visor, when fully open, is protected by the sun peak. 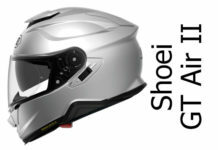 Drop the helmet and the peak will stop the visor from getting gravel rash. Cool. 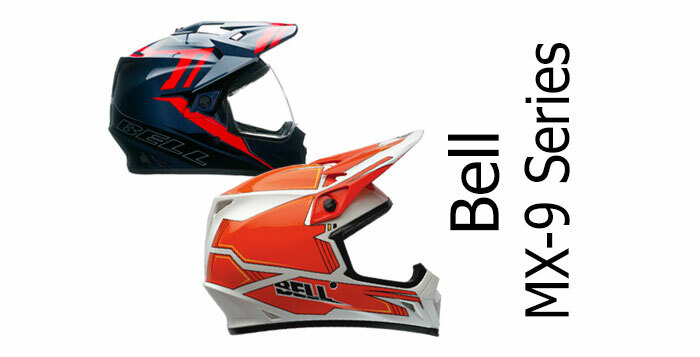 You can use goggles with either the motocross or adventure versions of the Bell MX-9. Reports are that the visor aperture is nice and wide and owners have used Builtwell and Fox goggles with no problems. On the Adventure, we’ve had reports that you can close the main visor while wearing goggles with few problems, though I guess that depends on the model of goggles you’re wearing. That sun peak is fixed to the helmet and not adjustable in the ‘slide forward/back’ sense. It does have two positions though, but you’ll have to: remove a screw, remove a bung, move the peak, screw in place, replace the bung, to adjust it. Not arduous to do of course and one of the slight corners Bell probably cut to get the MX-9 out at this low price. Instead of adjusting it, you can of course fully remove the peak if you’re going to be doing lots of street riding in the helmet and want to make it a bit more aerodynamic. It’s not too bad on the road with the peak fitted though. Owners reckon that up to 70 MPH you’ll know it’s there but it’s not too bad. Above that though and it starts to buffet a little – and you can feel it tugging during head checks. Both versions of the MX-9 share the same internals. That’s a fully removable and washable comfort liner that’s both moisture wicking and anti-microbial. 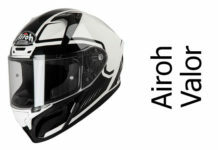 A few owners said they were surprised at the quality of the lining and more than a few have said that, overall, it’s a very comfortable helmet. Sizing sounds like it’s bang on – so no need to go a size smaller/larger. Just use our helmet fitting guide and you should be good to order the right size. And if you do find your new helmet could do with a little adjustment, you can order different size cheek pads to tailor the fit still more closely. Talking about cheek pads – you can usually find the join between cheek pads and the rest of the lining acting as a glasses groove to stop the stems of your glasses pressing into the side of your head. Unfortunately the MX-9s don’t work like that. And while we did hear from one guy saying he wears his shades in the MX9 with no problem, many owners reckon it’s not very comfortable with glasses and the lining does press them into your head. 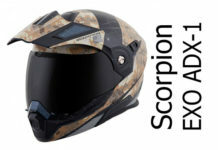 That’s a shame because the MX-9 offers great value as a mx or adventure helmet. 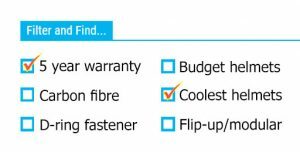 So, if you’re still not put off and want to try it for yourself, make sure you order from a retailer with a good returns policy (such as one of our recommended retailers). Or check out our pages showing helmets that work great with glasses. 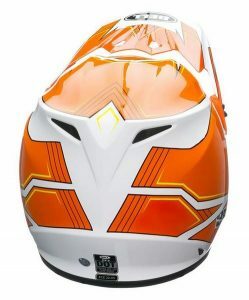 The Bell MX-9 is a great looking helmet and there’s a wide range of cool graphics to go with it. On this page you’ll find pictures of the Pinned, Airtrix, Blockade, Barracade, Scrub, Camo, Raid and Adventure designs. But to see the latest designs and for up to date prices, we recommend you click through to our recommended retailers using the links below. 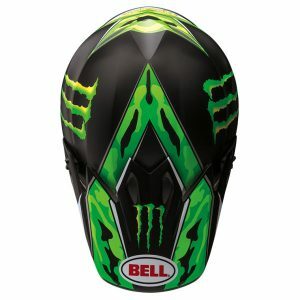 Best place to buy a Bell crash helmet? We think it's hard to beat SportsBikeShop as one of the best places in the UK to buy a Bell from. They offer outstanding service (9.8/10 on Trustpilot and 4.5/5 stars on their Facebook page) and have a 365 day refund policy. 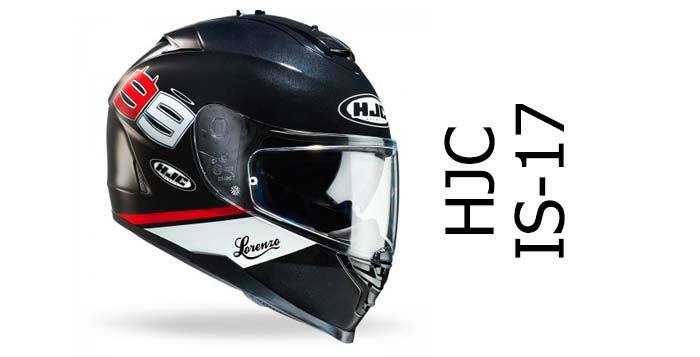 They offer very competitive prices and have a price match policy too - and they're our recommended retailer for quality of service and fast delivery (and have a good range of Bell helmets in stock). Please click below to visit their Bell page where you can see all the latest colour schemes and prices. And if you buy from there, we get a small sum from the sale at no extra cost to you - a massive THANKS! (it's how we finance the site). Here’s a couple of videos showing you the Bell MX-9 Adventure (top) and Motocross (bottom). The MX-9 isn’t really built for bluetooth headsets, but that’s not to say a few owners haven’t successfully fitted them. You’re probably going to need to stick them on rather than clamping, but owners of both Sena SMH5s and Cardo Scala Riders have said they’ve successfully fitted them with no problem. There’s lots of alternatives to both the MX-9 motocross and the MX-9 Adventure helmets. Check our motocross and adventure sections to see what’s on offer. The Bell MX-9s are great value helmets. There's the MX-9 Adventure and the MX-9 motocross versions - both polycarbonate with sun peak, great ventilation, comfortable, 5 year warranty - and owners love em, especially at this price. If you're after a durable motocross or adventure helmet but don't have the budget, the MX-9s are well worth checking out.